Discussion in 'Bonus Spins - Extra Spins - No Deposit Bonuses' started by Marina, Dec 6, 2018. Click here or on the image below to see if you are eligible for the Holiday Offer from CasinoRewards. 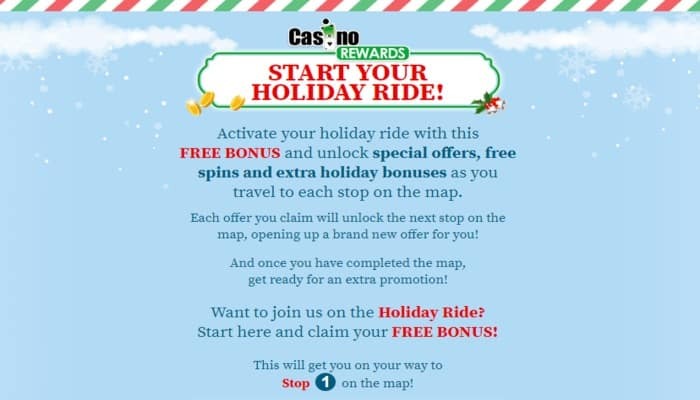 Casinorewards has again a nice promotion for the festive holidays - HOLIDAY RIDE. Some did already receive a letter from Casinorewards with information on how to claim a free bonus and more offers. You may try if you are eligible on this site www.casinorewards.com/santa . Once on the site, enter the Casinorewards username provided on the letter you received. We are only posting this information since it came to our attention that many players cannot find the site to claim because many are doing a search for the url instead entering the url in their browser and go directly to the site. Thank you very much CasinoRewards for this awesome gift! Who got a nice Christmas gift with this promo from Casinorewards? Sure hope many players can claim this nice Holiday Ride offers. Wishing everyone good luck! I got €50 no deposit bonus and a super match bonus offer for my next deposit to start my Holiday Ride. Although this is posted in the first post still people are emailing us to claim their Christmas gift from Casinorewards. Once again please.... We are NOT Casinorewards. We have posted the information on this offer from Casinorewards to help players get to the site to claim. All you have to do is, read the information and click on the link www.casinorewards.com/santa to get the page from Casinorewards to claim your offer.